I get a lot of questions from members of Freedom Boat Club about taking a boat out after dark. As part of club membership, boating hours are limited to sunup to sundown. But a member can take a boat out at night if they have a captain, which is a good idea for several reasons. Most people don’t understand the risks of boating after sundown. First of all, in Jacksonville, if you’re leaving from the Landing, there is a long stretch of pure darkness. The river is wide and has very little light until you reach Buckman, and then it’s sketchy untill you to get to Doctors Lake bridge. You have to be very careful to look at the markers and the lights. It is not uncommon for lights to be out on a marker and you could totally miss one. You should have your first mate and crew looking as well. In addition, crab traps are hard to see at night, especially if you’re in a big cruiser and you’re high up on the water. And you do not want to hit a crab trap, which can put a quick halt to a great night on the water. I had a member, Scott, who was coming back from the Palm Valley boat parade years ago, with a Captain at the helm, and a thick fog rolled in. They were going down the Intercoastal from the 210 bridge south, through the Guana, which is already tricky navigating and extremely dark. He was crawling along, watching the GPS and being very careful but it was still stressful. Scott said it was the scariest time he had ever had on a boat. As for my scariest time, my girlfriend and I started to go to Fort George and ended up with engine problems. We had to come in at night, navigating the Fort George inlet, which is tricky in daylight. I said a prayer and swore that if I made it through safely I would never do it again. And believe me, I won’t. Everything looks different at night. Shadows cast on the water and it’s very hard to get your bearings. Boating in the dark is tricky. You can’t see much of anything and that includes the stuff you’re about to hit. That’s probably why most of us keep our time on the water limited to the daylight hours. But if you go boating long enough, you might find yourself staring into the inky blackness of a night sky. Maybe mechanical difficulties postponed your return to the dock. Or perhaps you absolutely, positively, have to reach the next harbor before sunrise. Or some people think it might be fun. Gear up, even if you don’t really plan to be out after dark. Every boat should have an emergency flashlight aboard. A bag of glow-sticks is also helpful; if you find yourself out after dark have each crewmember crack one and put it in a pocket or on a lanyard, so if someone falls overboard they can be easily spotted. Turn down the ambient light. Dim everything you can as much as you can, from the chart-plotter to the courtesy lights. 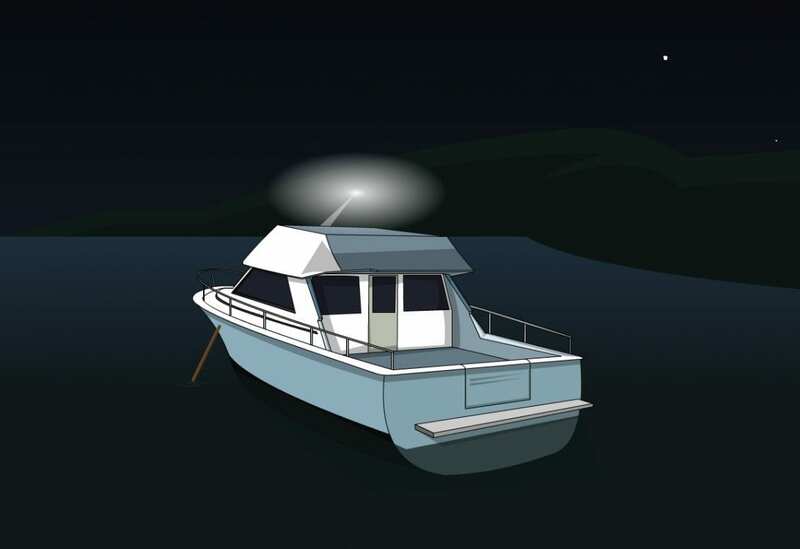 Any and all light on your boat reduces your ability to see beyond the bow, because your eyes automatically adjust to the amount of light available to them. Post a lookout, who isn’t at the helm. The captain has concerns that go beyond watching ahead. You have to monitor the gauges, adjust the throttle, and check the chart-plotter. In broad daylight you can afford to glance away now and again to take care of these tasks, but at night there must always — always — be a pair of eyes directed to the horizon, looking for crab traps and markers. Keep a towel handy. You can use it to drape over any light-giving item that you can’t afford to completely black out, like that chartplotter, gauges, or the VHF display. Then, when you need to look at these items, all you have to do is pull the towel away. Don’t believe your own eyes when they tell you the chartplotter is wrong. Things get deceiving on the water after dark, especially when looking for lighted landmarks. A close bell buoy may appear bigger and brighter than a distant lighthouse and can easily draw you off course. If your chartplotter tells you one thing, and your eyes tell you another, second-guess yourself — and slow down even more, if possible, until you figure out what is right.